I am a big fan of Japan. Of course one of the primary reasons is that I lived there for 3 years as a child. Part of my regular reading is two blogs written by fellow Blogger member Orchid64. 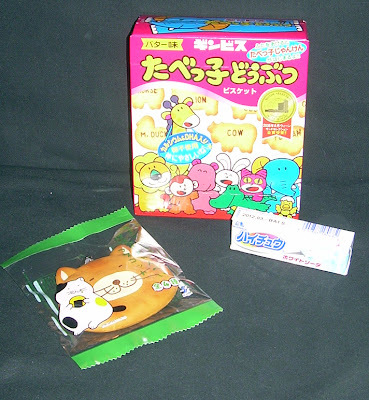 She has two blogs,1000 Things About Japan, and her snack food review Japanese Snack Reviews. However, one day on the snack blog she had a contest for her readers to win two snacks and a toy just by commenting on the post. Surprisingly, I won. My wife and I enjoyed the crackers, and the gum is waiting for me to get a good picture before I do a taste and review. If you are interested in the different facets of life in Japan you need to check out her 1000 Things About Japan blog to hear what it is like to live in Japan for 2 decades and what she will or won't miss when she finally moves back to the US. There are also a few posts in the series that she made around the time of the March 2011 earthquake. Very enlightening look at life in Tokyo from someone actually there instead of the FUD we heard from the news channels. Thank you Orchid64, they were delicious!